A Review of No Use for a Name's November 2nd Concert. Velvet Jones club owner Craig Jenkins must have thought he was taking a risk when he booked a jam-packed bill featuring No Use for A Name and Pully this Halloween weekend-a well-recognized time for festivities in Santa Barbara. But, as always, the cream rose to the top, and crowds showed aplenty on Sunday night. An impressive turnout indeed, show-goers kept the evening mellow by leaving the bar tender with little to do, keeping their hands to themselves, and avoiding the whole mosh pit thing altogether. What kind of punk show was this? 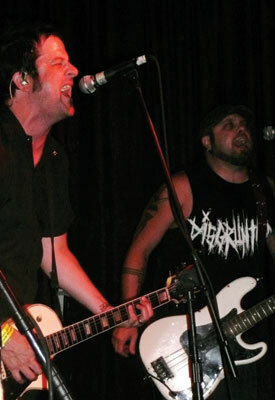 No Use For A Name's Tony Sly (left) and Matt Riddle plowed through a set of ska-punk tunes during the band's Sunday night show at Velvet Jones. Before dropping into their set, lead singer Tony Sly shouted an apology to the crowd for being so hungover, and after the same song, bassist and vocalist Matt Riddle shrugged, saying, “If I appear to be playing slow, it’s because I’m on Valium.” Perhaps they thought this proved their nonchalant punk-ness, but instead the band’s rants just came off sounding rehearsed, eventually becoming little more than a tiresome shtick. No Use for A Name’s brand of rock, a quasi-marriage of punk and ska, has for the most part been dead since the late ’90s-which isn’t to say that the guys didn’t play the same old songs well. Anarchy is usually the rule of punk rock, but this didn’t stop Sly from continually seeking validation via the phrase, “Does anybody care?,” which showed up both in song and during his talks with the crowd. One had to wonder if, by announcing that this would be the band’s last North American tour before taking it back as a joke, the frontman wasn’t just searching for a little extra lovin’. Despite the band’s need to toughen up, those who showed up on Sunday night flashed metal signs and sang along to old favorites without getting into any fistfights or spilling their beers. The fans, it seemed, had been there, done that at this point in their lives-perhaps a sign that No Use for A Name should mature a little, explore some new ground, or simply push the envelope into something a little edgier.